Vertical climber’s machines are the best home fitness solution; they provide an intense cardiovascular workout in the comfort of your home, more than any exercise bike or any treadmill. Vertical climber machines emulate the movement made when climbing on rocks or wall but at the same time pitting you against your weight to give high-intensity resistance. A lot of people already have this equipment however majority choose the wrong vertical climber and end up getting frustrated by the idea of a vertical climbers idea. If you are a not a gym buff and only need an affordable cheap equipment, then you need to carefully consider digging a little deeper before you pick your vertical climber. Below we have compiled a list of the best vertical climber machines you can find on the market. 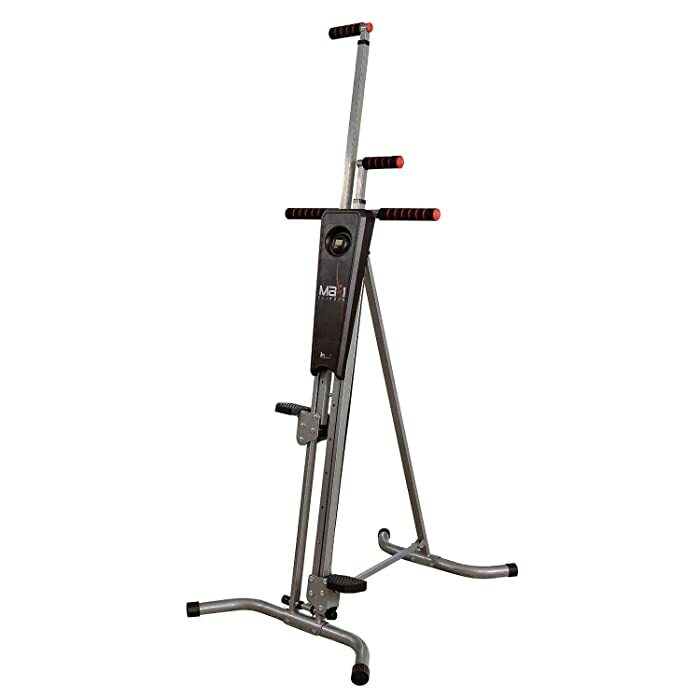 Out of the many vertical climber machines out there, Maxi vertical climber is the most rated and so far, among the best vertical climber machine on the market right now.Unlike other vertical climbers, Maxi has some adjust the setting and user-friendly function, which makes it pretty easy to use and readily operable. One of the best features of Maxi vertical climber is that it is entirely adjustable, which basically means that it has been designed for almost all body types and anybody height. It also has an ergonomic design; it may look very advanced at first sight, but it actually can fit all body types. The manufacturer claims that it can hold up to 220 pounds, but uses claims to hold up to 250 Pounds, the point is? MeanT for you and your entire family. Maxi Climber features an isometric non-stick grip for its handles providing cushioning for your hand so that you can’t get or slip. It is designed to hold your body weight needed to provide resistance. You literally do not need any extra tools to help burn calories. Maxi Climber is one of the vertical climber exercise machines with a space saving design, but of course, you will need a space to store it. It is foldable so you can store it in any place like behind the door or in your closet, or even stashed in your office corner and it won’t be one the way of anyone. It only weighs 33 pounds and comes preassembled. The ergonomic design, the pedal allows comfort during the session. It’s completely easy to store and carry thanks to the foldable design. It features a bio –X technology that helps you to engage the abs and core every step you take. It lacks some workout metrics such as step count and calorie counts. The viewing console is hard when training. There is no added resistance meaning machine lifespan is reduced. First, this is not a budget friendly kind of vertical climber, so you are on a budget, Maxi may be your best bet. However, if you need more performance, resistance, and better way to calculate your calories loss, the Ancheer vertical climber machine is your perfect fit. The pink may seem to appeal female market but trust me, this is one of the few climbers out there more than capable of getting you through your paces regardless of your gender, age or weight!First, it is a﻿ ﻿﻿﻿2-in﻿﻿-1 machine with a small resistance bike just beside the climber, which means more workouts. Much like the Maxi, it has an adjustable height – something that is lacking in most of the alternatives. It also features the foam handlesidealfeatures if you like to undertake an extended workout. Lastly, its LED display is incredible, so much more than competitors, as it provides the all the information you need; time, distance, speed, scan, and calories. It is cute enough to complement anyone, men, or women. Conquer is one of the simple- to assemble vertical climber you will find besides Maxi.It’s basically an upgrade of the previous model which had a cable that kept snapping. This version has no more cable, and it works pretty much as the original one but now with an added stability. It features a built-in rubber non-slip pad; thusit is extremely stable so no worry about safety issues. The conquer also comes with an adjustable climbing arms to accommodate persons of different heights. The resistance is quite good on this one; the base is stable with four anti-slip rubber feet and one of a kind ergonomic grip handles. Also, conquers vertical machine is easily foldable; the footprint measures around 37 inches across and 20 inches on folding so that you save space when not using it. It also has a personal timer and calorie counter. Easy assembly; you won’t take more than ten minutes to assemble it. Merax is one of the few vertical climbers that are compact, sturdy and creatively designed to accommodate all user’s shapes and sizes, above the competing brands. The machines feature a movable Isometric, non-stick grips and very sturdy leg pegs which means your safety is guaranteed. 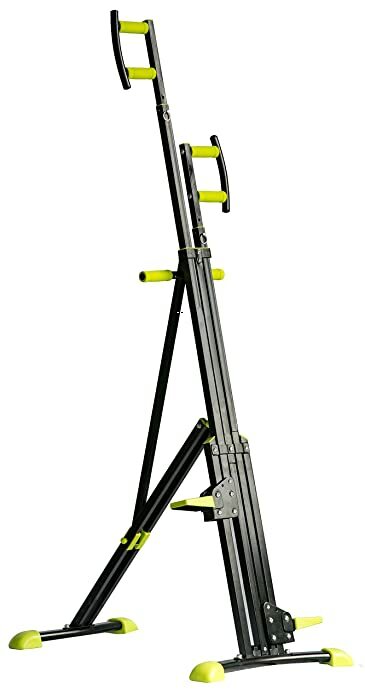 Thin or heavy, tall, short; the Merax climber machine is right there to accommodate your needs. It features adjustable height and has a weight capacity of around 220-330 pounds, which is way beyond other brands. Conquer for instance recently upgraded its vertical machine designed for heavier use but it just listed with an upper weight limit of around 275 pounds, so this is a great plus. Merax is not a budget friendly alternative. When you are in need of a climber that goes above and beyond, the Conquer 6 in 1 is your perfect pick. 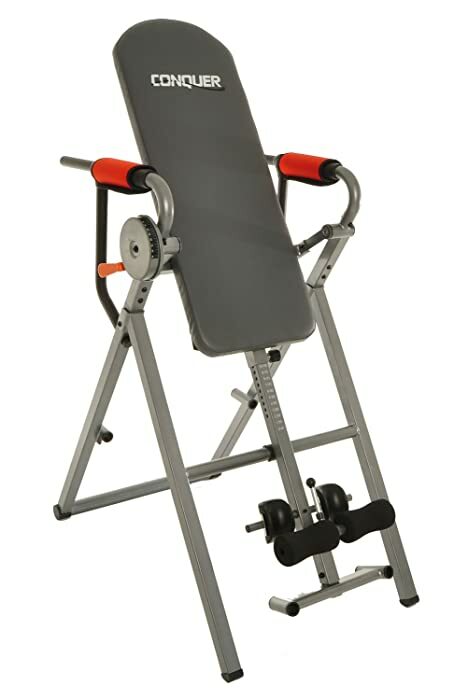 Unlike other machines on this list, it offers six functions all in one machine, so conquer 6 in 1 inversion table power tower is one of the versatile machines you will come across so far. Users can use it as an inversion table or have a complete several exercises, like chin-ups, or pushups, squats, dips, and leg raises. It doesn't hold too heavy user, but for those under 220 pounds, this is a perfect pick to use when in need of eliminating monthly gym pass. In simple words, this machine is way ahead of other similar brands. Offer six functions on the same machine. It’s compact and doesn’t take much of your space. Some user claims that most of the functions of the machine are designed for men. A vertical climber is definitely a fantastic home workout tool with so many physical benefits, and unlike other home fitness equipment such as recumbent bike and stepper, vertical climbers are easy to use, versatile, and for sure won’t cost that much. Such are the kind of features you need when looking for a home ﻿﻿fitness﻿﻿ equipment to help lose weight as well as strengthen and tone muscles, while at the same time working out your cardiovascular system. You will, of course, need the best vertical climber your money can buy, and these reviews should make your shopping experience easy. Out of all machines reviewed here, the best option would be the Maxi Climber especially in terms of price and value for money. Even if you don’t prefer any of these machines, just keep the key considerations of buying a good vertical climber in mind.